1. Which of the following least value should be added to 1440 to make it divisible by 3, 5, and 11? 2. P, Q and R can complete a work in 10, 12 and 15 days respectively. All three of them starts together but after 2 days P leaves the job and Q left the job 3 days before the work was complete. R completes the remaining work alone. In how many days was the total work complete? So, the whole work will be completed in 7 days. 3. One of the diagonal of a rhombus is 70% of the other diagonal. What is the ratio of area of rhombus to the square of the length of the larger diagonal? 6. The horizontal distance of a kite from the boy flying it is 30m and 50 m of cord is out from the roll. If the wind moves the kite horizontally at the rate of 5 km/h directly away from the boy, how fast is the cord being released? 8. The sum of the numbers from 1 to 100, which are not divisible by 3 and 5 is. 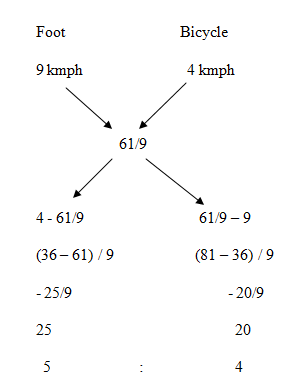 Directions (9 – 10): Read the following and answer the question. (iii) As of now the corporate profit tax rate is zero. But the government of India thinking of imposing 25% tax on the profit of the company. 9. As of now, what is the profit maximizing output? 10. If the Government imposes the 25% corporate profit tax, then what will be the profit maximizing output? Even after imposing tax on profit the profit maximizing output will still be 22. 1) Which of the following least value should be added to 1440 to make it divisible by 3, 5, and 11? 2) P, Q and R can complete a work in 10, 12 and 15 days respectively. All three of them starts together but after 2 days P leaves the job and Q left the job 3 days before the work was complete. R completes the remaining work alone. In how many days was the total work complete? 3) One of the diagonal of a rhombus is 70% of the other diagonal. What is the ratio of area of rhombus to the square of the length of the larger diagonal? 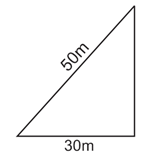 6) The horizontal distance of a kite from the boy flying it is 30m and 50 m of cord is out from the roll. If the wind moves the kite horizontally at the rate of 5 km/h directly away from the boy, how fast is the cord being released? 8) The sum of the numbers from 1 to 100, which are not divisible by 3 and 5 is. 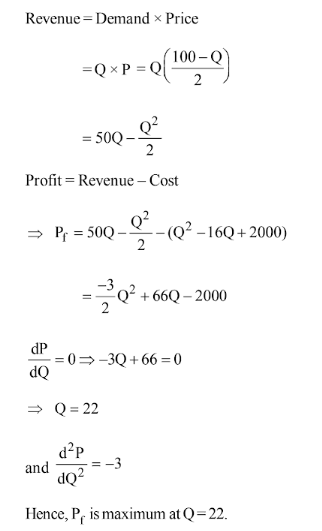 9) As of now, what is the profit maximizing output? 10) If the Government imposes the 25% corporate profit tax, then what will be the profit maximizing output?